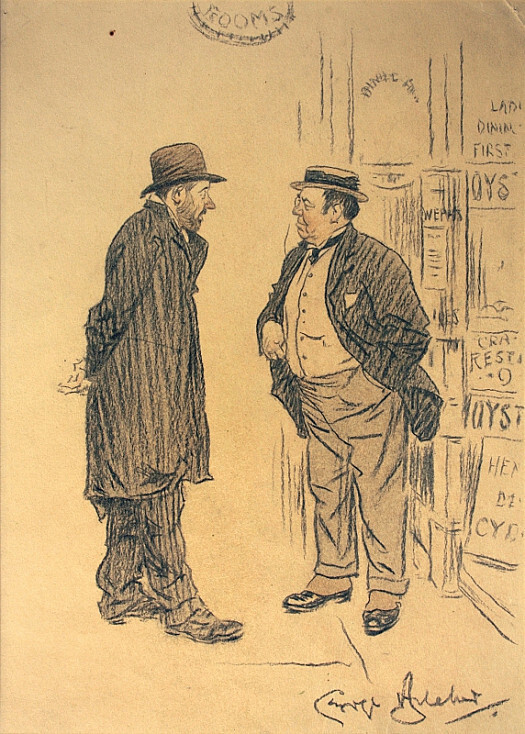 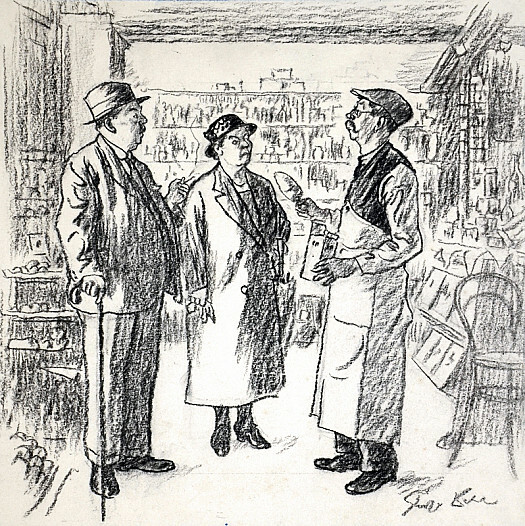 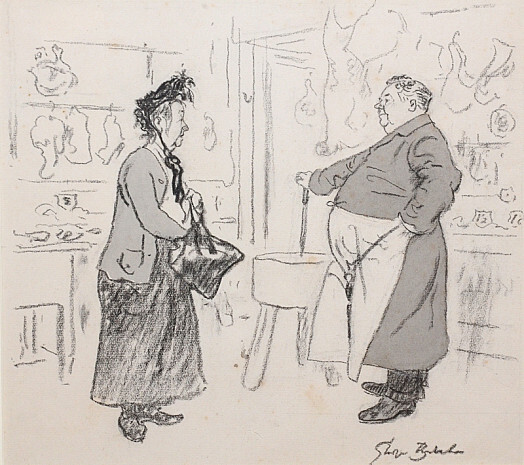 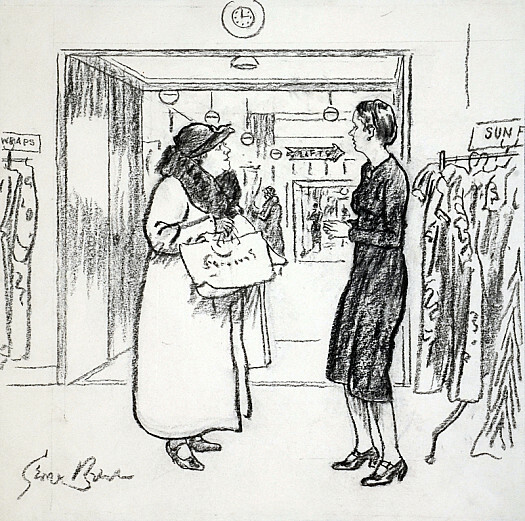 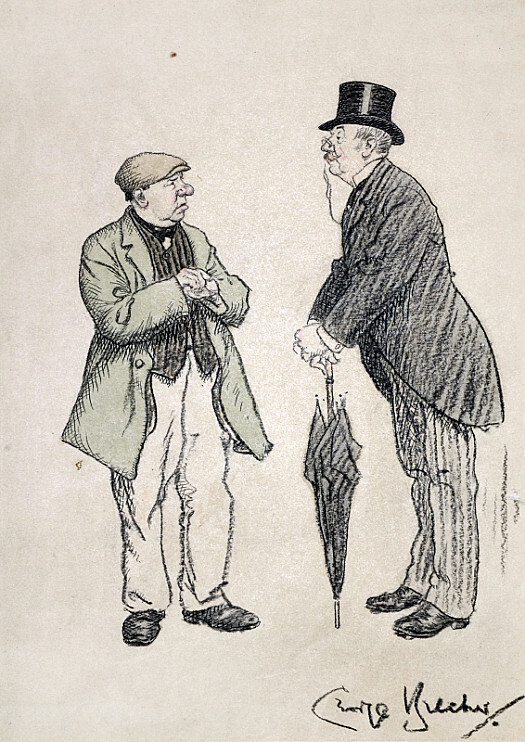 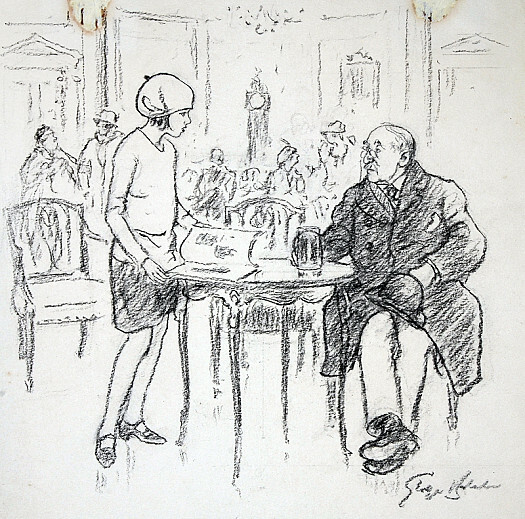 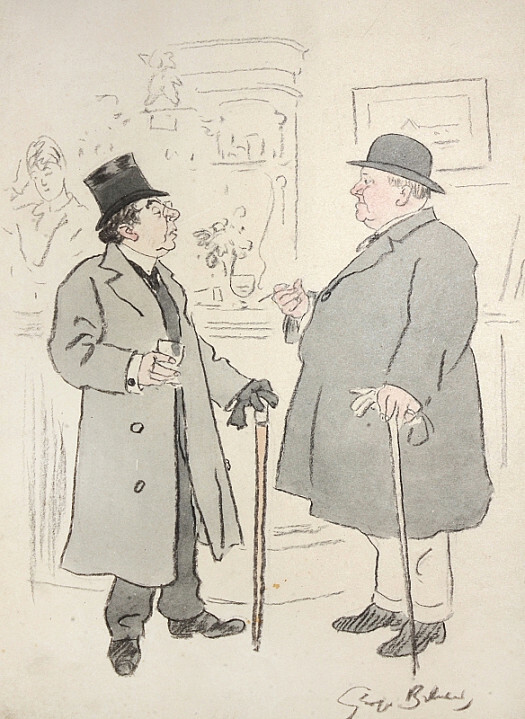 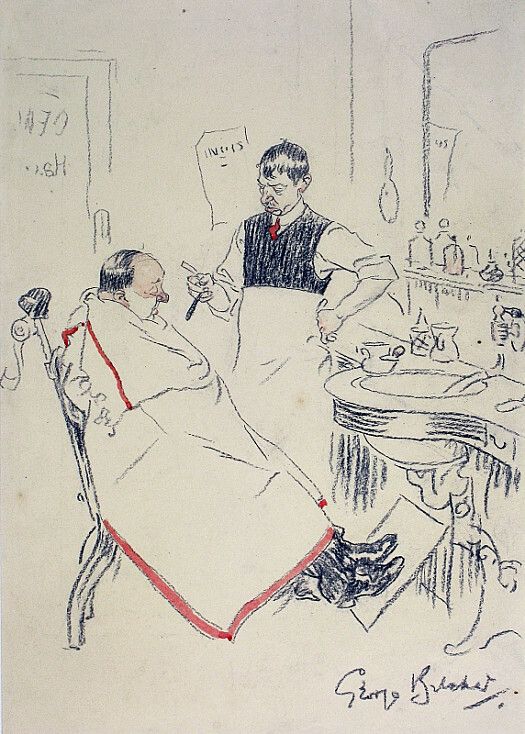 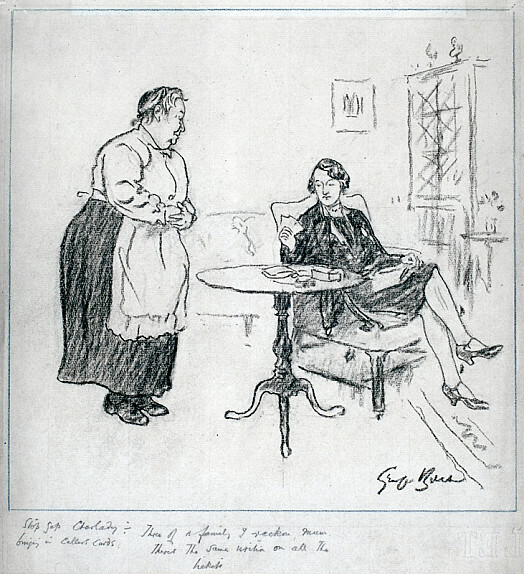 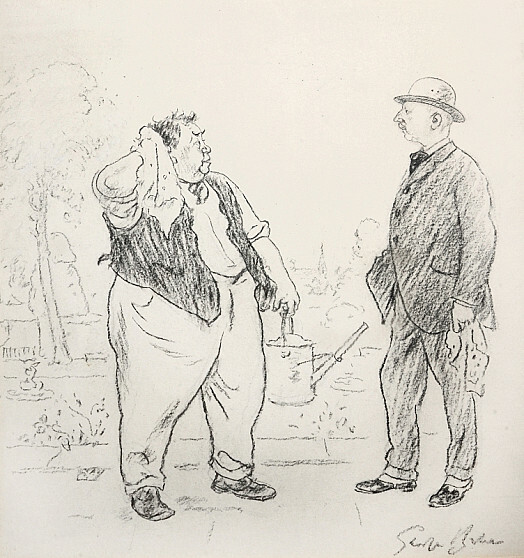 George Belcher was best known for his elegant drawings, in chalk or charcoal, of gently humorous exchanges, often between working-class protagonists. 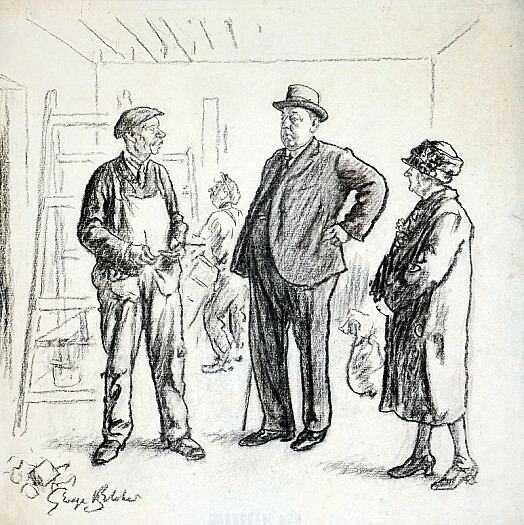 George Belcher was born in London on 19 September 1875, the son of Dr Joseph Belcher. 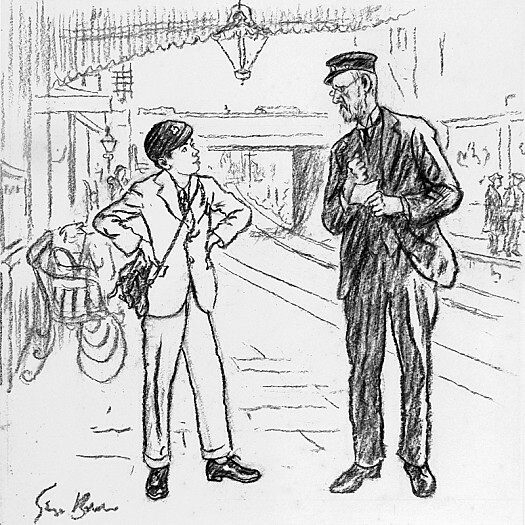 He was educated at King Edward VI School, Berkhamstead, and then studied at Gloucester School of Art. 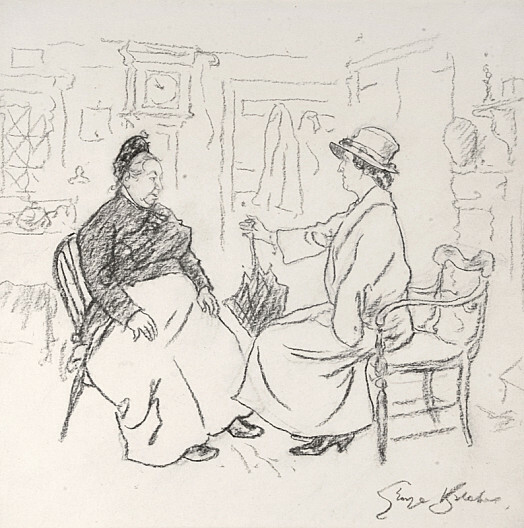 Beginning to work as a portraitist and caricaturist in a variety of media, he exhibited at the Royal Academy from 1909, and gained the rare distinction, for a humorous artist, of becoming an Academician (ARA 1931, RA 1946). 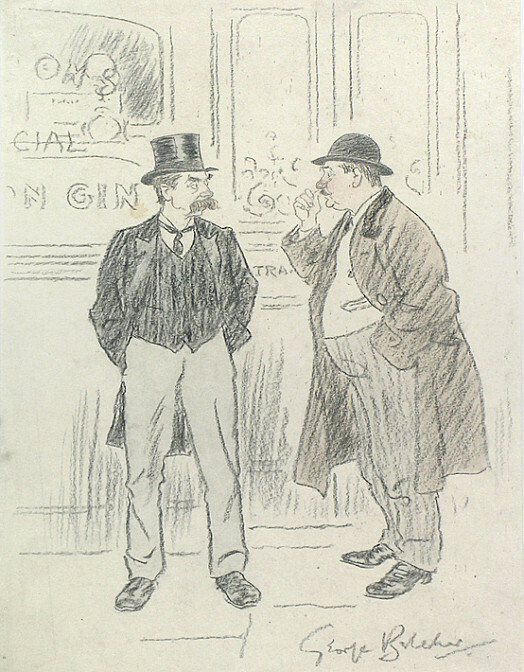 Contributing regularly to Punch (from 1911), and to The Tatler and Vanity Fair, he became so well known for his studies in chalk and charcoal that he was described by Fougasse as ‘Phil May in chalk’. 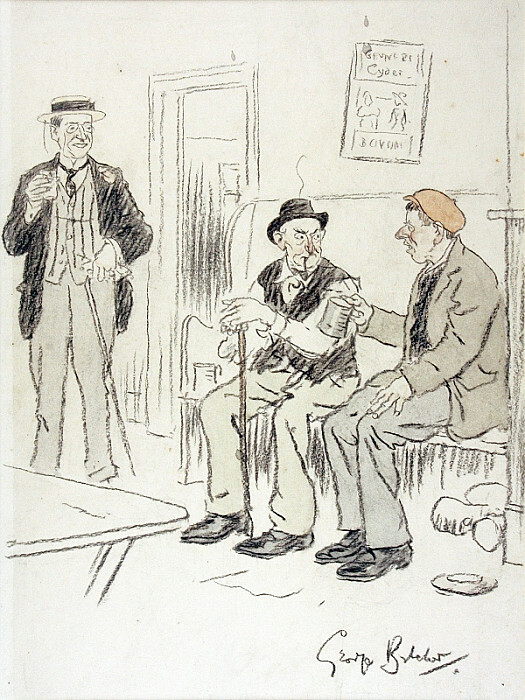 However, his work was more genteel than that of May, and his working-class subjects were more kindly but less vigorously drawn. 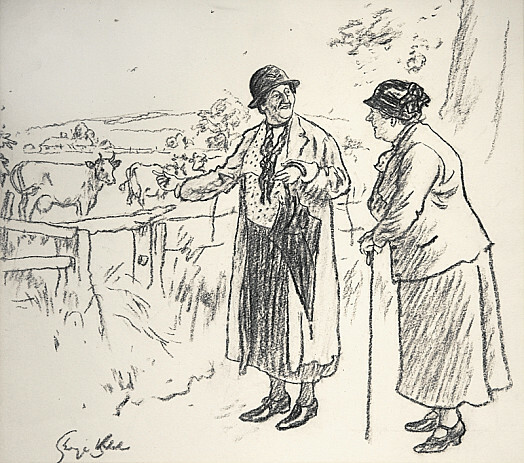 It is probable that he was more at home with the social standing of such sitters as H G Wells, and his pastimes – of hunting and fishing – were certainly those of the country gentleman. 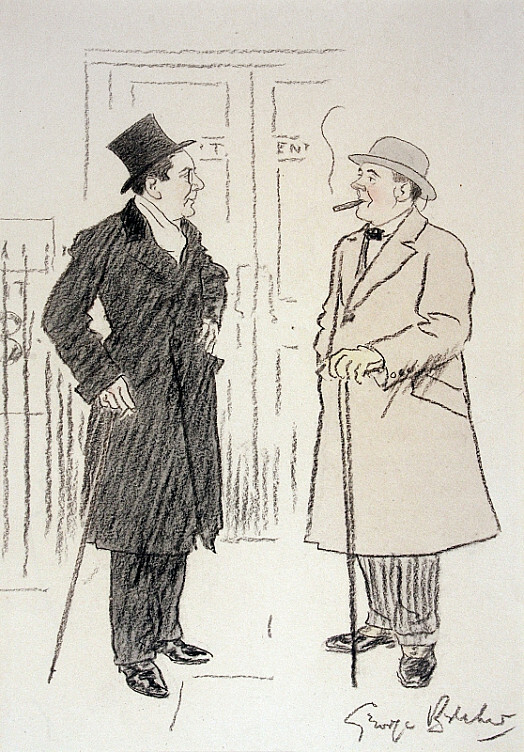 Living for some years in Knightsbridge, Belcher spent his later life at Chiddingfold, Surrey, and died there on 3 October 1947. 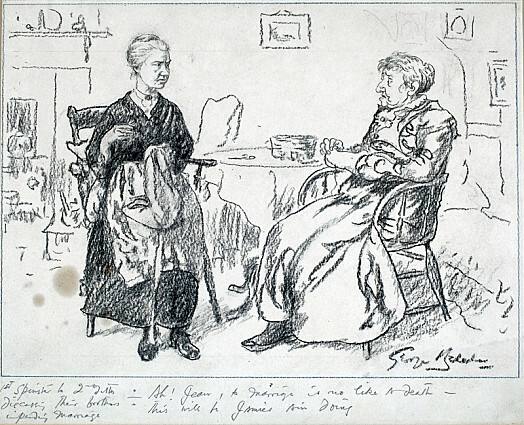 In his retirement he had begun to paint still life and flowers in oils. 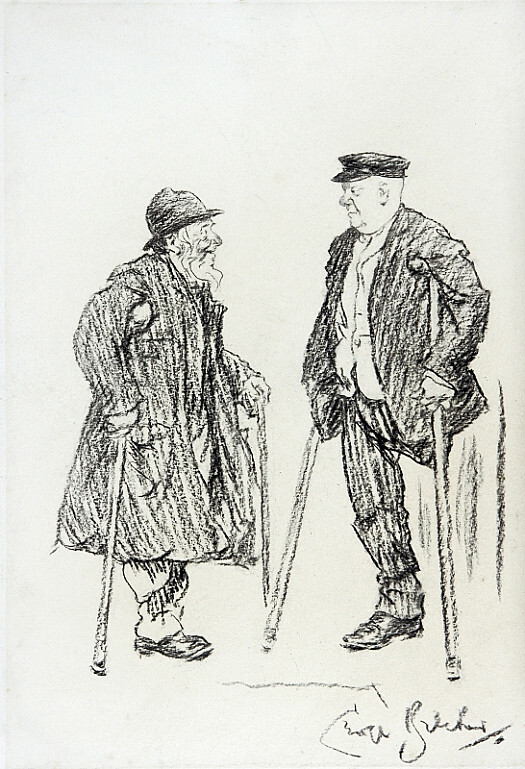 His work is represented in numerous public collections, including the V&A; and Worthing Museum and Art Gallery.